Springfield, MA (July 2, 2018) – Springfield police were busy early Sunday morning responding to an injury accident. The crash happened at a four way intersection on Meliville Street and Merrimack Avenue. Lt. Ervin Greene with the Springfield Police reports that the crash involved two vehicles at the intersection. 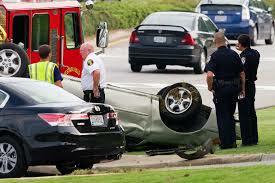 The force of the collision caused one of the vehicles to roll over and land on its side. The vehicle was still lying sideways when police arrived on the scene. One person was injured in this crash and was taken to a hospital via ambulance. The extent and severity of their injuries was not immediately known. Springfield police continue to investigate and have not said what caused the crash nor have they issued any charges for the collision at this time. Further information will be reported as it becomes available. We are saddened to hear of this rollover crash in Springfield. With thousands of motorists traveling on streets and highways daily across our state, accidents are bound to happen. They happen when you least expect and seemingly at the most inopportune times and, in many cases, cause significant disruptions to your normal routine.